In November 2010, Gogebic Taconite (G-Tac), a subsidiary of The Cline Group, announced plans for a $1.5 billion iron ore mine in the pristine Penokee Mountains in Northern Wisconsin. 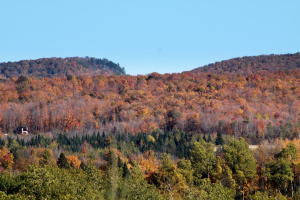 The open pit mine would sprawl over four miles of privately-held managed forest land . Open pit iron mining has a larger and more destructive impact on the environment than underground mining. The water, air, and land are impacted by drilling, blasting, crushing, and processing activities of this industry . G-Tac’s mine proposal included two pits as deep as 1,000 feet that would produce about 8 million tons of finished taconite annually . 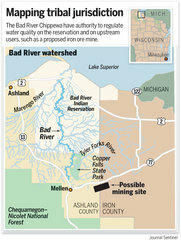 Despite the promise of hundreds of mining jobs and promised economic benefits from the company, this project ignited one of the largest environmental battles in decades, with opponents expressing concerns over the effect the mine would have on the Bad River watershed . Many of the opponents included tribes. 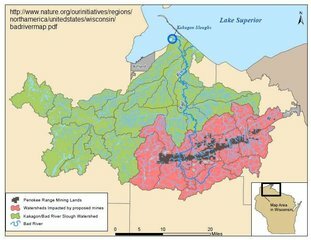 The planned area of the mine was located directly over the Bad River Watershed through which many streams flow directly into Lake Superior and through the famed wild rice beds on the Bad River Ojibwe Reservation . 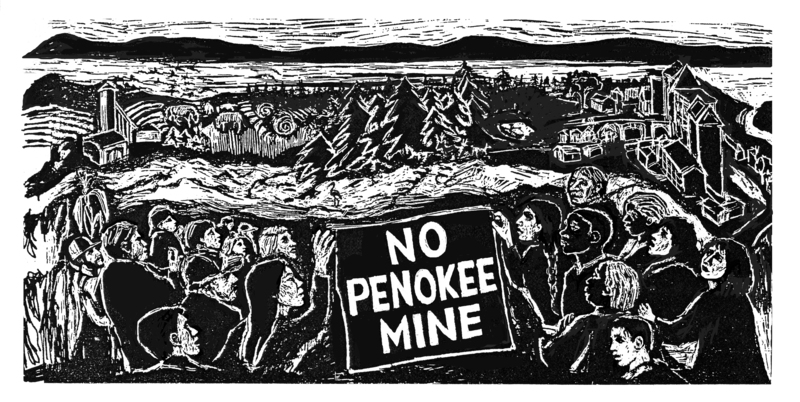 There are two primary concerns the tribe has: they were not consulted or included in any of the decision-making related to the mine proposal, and numerous environmental issues the mine presented. In February 2013, the Bad River Band of Lake Superior Chippewa Tribe sent a letter to Senator Tom Tiffany expressing their concerns that the Wisconsin State Legislature failed to engage the Tribe in government-to-government consultation and conducted the public hearing process in a way to exclude the voices of Native American citizens . That year, the State Senate had one public hearing in January regarding the Bad River Watershed Destruction Act which was passed in March 2013 and gave innumerable protections to G-Tac. It demolished environmental safeguards related to mining, eliminated public input, reduced revenues to local communities, and rushed the permit review process . 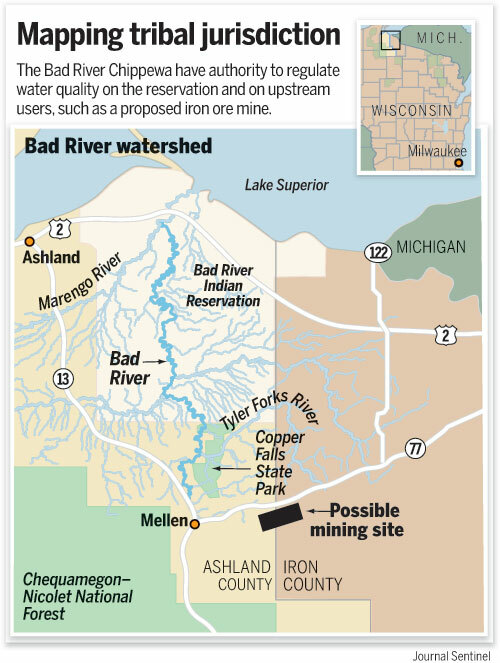 Two studies published in 2012 found that the mine would cause severe environmental implications. A February 2012 report suggested that over a 35 year life span, the mine would produce waste rock that could form a hill 500 feet high and 1.5 miles long, and tailings that, if stacked evenly over 3,750 acres of land leased by G-Tac from Iron County, would be 47 feet deep . A July 2012 geological study by Lawrence University researchers found that the first phase of the mine alone would produce nearly 2.5 billion pounds of sulfur from pyrite in the waste rock, which would produce sulfuric acid and sulfates when exposed to air and water. Acid mine drainage would leach other heavy metals present in waste rock including arsenic, copper, mercury, and zinc as well as phosphorous - all major water pollutants . 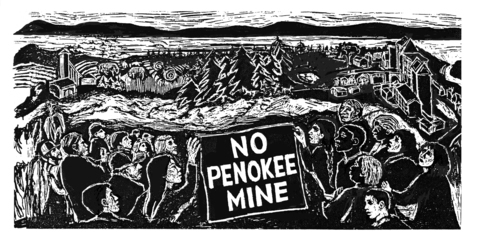 Environmental concerns and being left out of the public hearing process reflected the long-existing injustice of Native American reservations being disproportionately impacted by mining, both ecologically and economically, and being treated as lawless zones by mining corporations . Concerned citizens responded by protesting at the proposed mine site, setting up educational booths, monitoring G-Tac’s bulk sampling activities, and writing letters to representatives and the President of the United States. In 2013, one of the tribes had established an educational camp near the mining site to draw attention to how the mine would violate its treaty rights, as well as to highlight sustainable alternatives to mining. A minor incident with protesters led G-Tac to hire an out-of-state private security firm which sent armed guards to patrol the mine site . Six tribal leaders sought redress from the federal government in August by sending a letter to the President asking him to direct the Department of Interior to prevent the construction of the mine, citing their claims that the mine would infringe on their treaty rights. Due to mapping of abundant wetlands in the area  and a decline in iron prices, G-Tac announced their plans to abandon its mining project application on March 24, 2015 and closed the company’s office. The Department of Natural Resources (DNR) received a preapplication withdrawal letter from G-Tac and will continue to work with the company to complete necessary work on the site to ensure the site is properly maintained and environmentally stable. As of March 24th, all Managed Forest Law land that was previously temporarily closed to public access is now reopened to the public for hunting, fishing, hiking, sight-seeing, and cross-country skiing . Even though it is only a temporary success for the tribes, the mining debate helped create new and surprising alliances between tribal groups and local citizens. 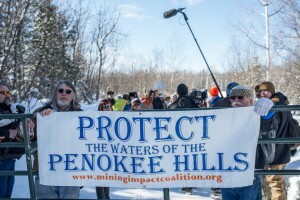 Opponents of the mine worked to educate county board members and local citizens about the real human cost of the mine . Project Details The proposed 4.5 mile wide mine would have produced 8 million tons of finished taconite annually, rivaling the huge Hibbing Taconite in Minnesota. With two pits plunging as deep as 1,000 feet, the mine would sprawl over four miles and operate for decades. A February, 2012 report suggests that over a 35 year life span, the mine would ship 25% more ore than the everything taken out of Gogebic Range mines between 1880 and 1966, with waste rock that could form a hill 500 feet high and 1.5 miles long (the size of Rib Mountain), and tailings that, if stacked evenly over 3,750 acres of land leased by G-Tac from Iron County, would be 47 feet deep . A separate geological study by Lawrence University researchers found that the first phase of the mine alone would produce 2.5 billion pounds of sulfur from pyrite (iron sulfide) in the waste rock . Development of Alternatives In 2013, one of the tribes had established an educational camp near the mining site to draw attention to how the mine would violate its treaty rights, as well as to highlight sustainable alternatives to mining. Even though it is only a temporary success for the tribes, the mining debate helped create new and surprising alliances between tribal groups and local citizens. Opponents of the mine worked to educate county board members and local citizens about the real human cost of the mine . Why? Explain briefly. As a result of dedicated efforts of tribes, citizens, and local community groups, the company was forced to conduct further environmental studies and subsequently cancelled the project. Bad River Band Letter to Senator Tiffany. February 1, 2013. Blog - Woods Person. The Potential Impact of Waste Rock and Tailings Volumes in the Proposed Gogebic Open Pit Mine. February 23, 2012. Sierra Club Wisconsin John Muir Chapter. Issues - Blocking Destructive Mining. Bjornerud, Knudsen, and Trotter 2012. 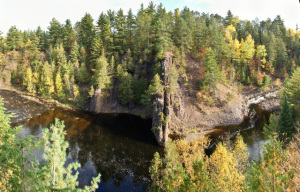 Geochemical, mineralogical, and structural characterization of the Tyler Formation and Ironwood Iron Formation, Gogebic Range, Wisconsin. Great Lakes Indian Fish and Wildlife Commission. July 31, 2012. Kaufman, Dan 2014. The Fight for Wisconsin's Soul. The New York Times. March 29, 2014. Wisconsin Public Radio. 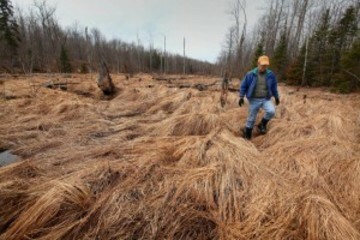 GTAC Finds More Wetlands Than It Initially Expected in Penokees. Mike Simonson. September 9, 2014.